Rob, this was, by far, our best Canadian fishing trip ever! The service we received was fantastic, from housekeeping to personal launching/docking, from new customer guide service to free fish cleaning; everything was first class all the way. Our unit was immaculately clean, beds were extremely comfortable, and ceiling fans in every room were a life-saver! Our view was perfect and daily towel service was an appreciated added bonus! Your grounds were simply beautiful and well maintained. You provide the newest and most efficient boats/motors. After fishing off a 17-1/2 ft Lund with a 40 hp Yamaha 4-stroke engine with newly mounted easy-to-use trolling motors, live wells, fish locators, with all necessary equipment supplied free of charge, it's difficult to go back to our "normal" set-up! We were all pleasantly surprised at the boat house/office and it's use of a computer, gift shop, fresh popcorn/coffee, TV to watch, and to simply sit, lounge and converse - what a great idea! We utilized the mini Laundromat that saved us much time/work upon our return home. The staff surpassed any we have encountered thus far. They were extremely friendly, efficient, and helpful! It's quite obvious this camp is run utilizing a team effort and have become a "family"! Rob, our thanks to you and all who made this fishing trip the most enjoyable ever. I will recommend Stanley's Resort to all our fishing friends/family. Can't wait to see you all again in June, 2007, and for many more years to come! God Bless! I want to thank you again for the wonderful time (illness not withstanding) we had at your resort. Your staff is great - freindly and well versed without being "hovering". Great group. Kevin worked for 6 seasons at Ludlow's Island on Vermillion - which has a very similar feel. You father was patient with the two children I brought along the last day - more patient than I was.They are usually much better sports than they were that day. One was sick and the other is a perfectionist 7 yr old who had a bit of a hissy when he botched a cast or lost a lure. Not to mention the brother/sister thing on top of it. He was frustrated with what he called "the strange day" (meaning the lack of fish) - I wasn't. Please thank him again for me. Please extend our thanks to all the wonderful people at Stanleys who made our recent fishing trip such an awesome vacation. Sheldon, John, Bayne, Scottie, Marv, Rob and Chantelle (sp? sorry if it's wrong)--you were all a huge contributing factor to our total enjoyment at Stanleys. I have to say that Ken and Tom felt the highlight of the trip was the muskie fishing. I think they're "hooked!" Attached is a picture I took inside the float plane when Rob took our family for a tour. We had a GREAT time during our stay at Stanleys! The guys are still working on the theme song. It was an experience we will never forget. Just wanted to dropped you a note and a couple pictures from our record setting day (254 fish) on the catch and release lake. Please let me know if our total stood all summer. (Can't remember the name of the lake.) The 2 photos show the largest, 41-1/2" by Jeremy Goodrich, and the smallest, 1-1/2" by yours truly. The smaller "fish" was not counted in the 254 because it was foul hooked. Thanks again for a great vacation. My father and I had the best week of fishing we could have imagined. Attached are just a few shots of some of the pike and walleye (and even one musky) we caught. We kept only a few walleye to eat and I can't even begin to guess how many fish we released. Hope we'll be able to get up there again sometime! Sorry so late with the "Thank You" everyone for our stay in August. Once again we had a great time and the fishing was fabulous. We can't wait to come back up next year. Hopefully all the guys will be able to make it next year. Finally got my pictures back, I wanted to share a couple with you. The 29.5 walleye and the Northern were caught within sight of the resort. I was going to post them on your message board, but I'm not that computer savvy. Have a great winter and thanks again for the great trip. I wanted to write and thank you for the great week we had at Stanley's. As you may or may not know, I have been coming to Eagle Lake since 1972 with grandparents, cousins, aunts, uncles, brothers, etc. For years we stayed at #######, and enjoyed it thoroughly, but in the past several years, it became a challenge. We turned to Stanley's and when we came there for the first time in 2004, I was so suprised! WE LOVED IT! The cabins were beautiful (yes - we were spoiled by the Hawkcliff, and now the Osprey), the staff friendly and helpful (very important in our book! 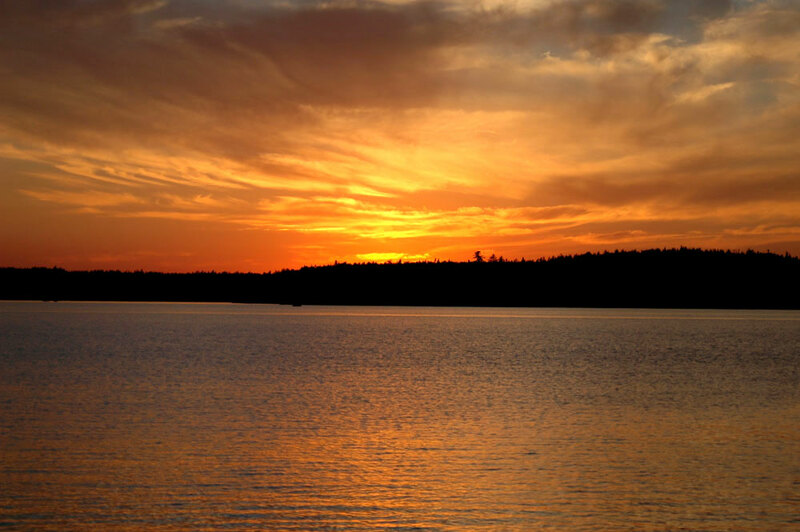 ), and we could remain on the most beautiful lake, Eagle. I cannot thank you enough for helping my family return to Eagle Lake with all the good memories and fun it holds. We look forward to bringing my nephew and his new wife as well as other family members (several neighbors are interested as well) in the years to come. Thank you so much for giving me hope of more good memories for years to come! Sorry it took so long to write. We just wanted to let you know what an awesome time we had at your resort this summer. We wanted to take one more family vacation before the kids started leaving the house & we couldn't have had anything better! We hope to go again some year. I have enclosed a picture of our son catching a fish up by you - I thought it was neat. Thanks again for a wonderful trip filled with many special memories. To all the staff that made our trip a special one. Thank-you so much for your quick smiles, your generous nature, and your ever present sense of fun. You all add a great deal by your own personalities to what makes S.W.A.C. a wonderful place. And a place that keeps calling us back for another visit. Thanks for a great vacation! God bless you all. We spent a week of supreme fishing on a pristine lake in a setting only one's mind could hope for. 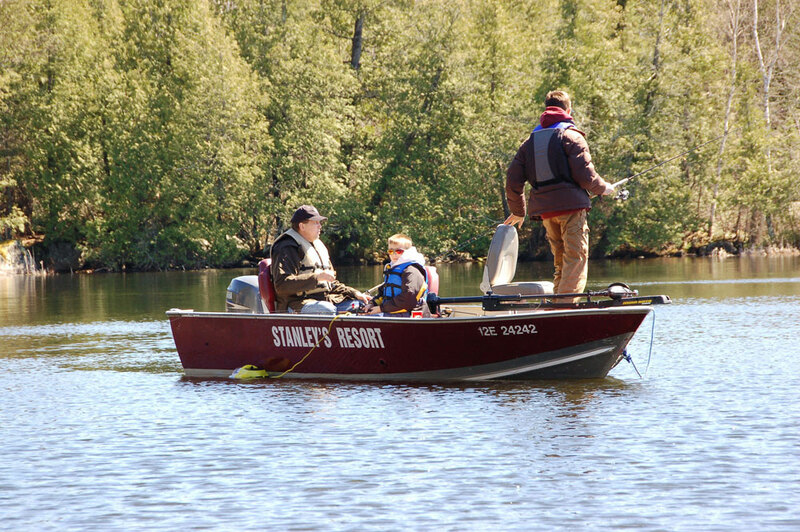 As first time clients at Stanley's, we were not rookies to vacationing and fishing in Canada. The difference at Stanley's is manifested in a number of ways. First the hospitality of the Stanley's family and their staff is superlative, and seemingly a well kept secret. They cater to our every wish and certainly to our needs. They were prepared to share fishing lore, techniques, and the "best spots" on the lake. 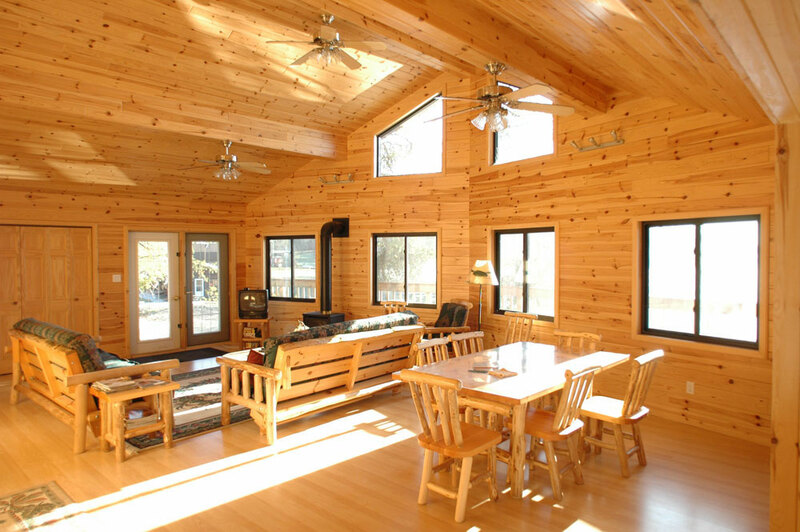 Second, the cabins and accommodating are clean, well designed, comfortable and fully equipped. Next, the attention to detail in service is much superior to other times, other places in their profession. You truly feel part of the family. They go out of their way to introduce their clients to each other while respecting the privacy of all. 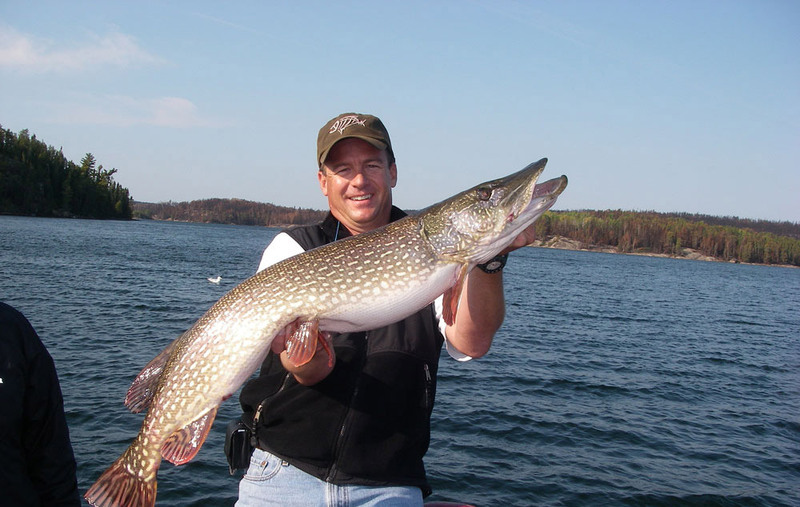 The value received from each service they provide; from bait, to boat handling instructions to lure and bait techniques and presentation are truly superlative for the novice and/or professional fisherman. Families are welcomed and children are accommodated with instruction and care. In short, this was a week of relaxing good times, fish production and hosting by a caring family and staff. Just a quick note to say thanks for a great few days of vacation. Your accommodations and service were outstanding! Far exceeding our expectations. My Dad, Brother and Son were all smiles all the way back to the states. As a small business owner it is always difficult to pay attention to the little details of service and meeting the publics demand, but you guys have done it. I have already recommended your Resort to a few friends that have walked in my office this morning. Good Luck the rest of the summer and hopefully, we will see you next year. who make a vacation there very SPECIAL! The hospitality was great...the equipment was super...and the whole experience is one we'll remember for a long while. A special thanks to those who planned and implemented the fish fry on Tuesday evening. It was first-class in every way--and the food was good, too! John and Callum were outstanding dock helpers. They don't wait to be asked...they anticipate what's needed...and they do it on the run. (They do a pretty good job of carving out great fillets, too!) Sheldon is in the same league as the two mentioned, but he was off most of our week learning his new trade. I'd mention Jim also except he never remembers who I am. What a week he had! Not one musky...not two of those giants...not even three...but (unbelievable) four in a week. Some guys cast for a lifetime and are glad when they finally boat one. Believe Jim needs a vacation before Baja California beckons again. Will be waiting for news about the newest member(s) of Carol & Marv's family. Speaking for our group and myself, I would like to thank you very much for our wonderful fishing week. The accommodations were wonderful (better than anywhere we've been in Canada). The staff was very friendly and accommodating. Most importantly, the fishing was excellent, (overall better than anywhere we've been in Canada). I will be in contact with you folks on October 1 to try to get booked next year for June. 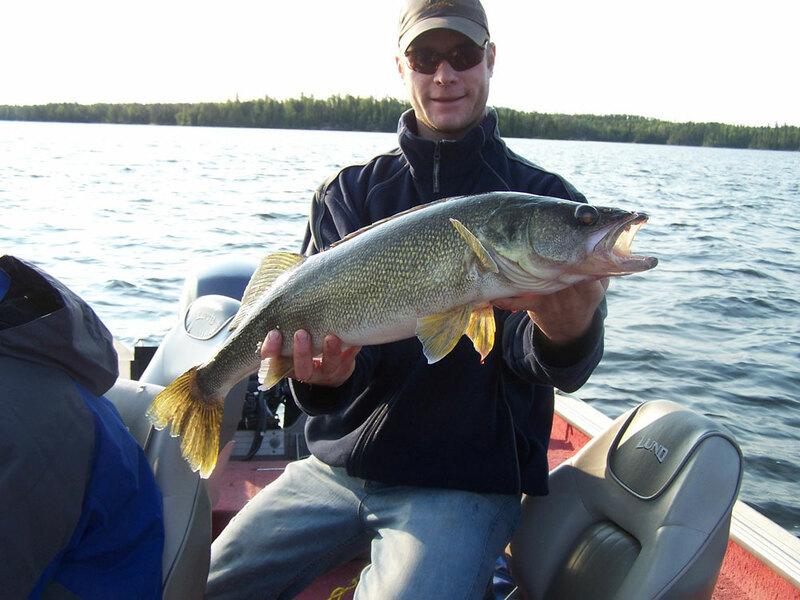 We really would like to catch some of those "earlier walleyes", and don't mind throwing back the big bass. We would either plan to come June 7 or June 28, if we can get in at that time. If not July would work. Once again, thank you very much and have a great summer. I will send you a picture of the 4.5 pound bass.